Absence of first-tier macroeconomic data kept the greenback rallying. US Federal Reserve Powell scheduled to speak this Tuesday. The American dollar is the overall winner this Monday, reaching fresh yearly highs against the shared currency, this last, weighed by concerns about slowing economic growth. The day was light in the data front, with no relevant macroeconomic releases, neither new headlines related to the political issues that worried speculative interest these last few months. Equities trade mostly in the green, while government bond yields traded with a soft tone, particularly European ones. EUR/USD decline accelerated once it lost the 1.1300 level, having traded as low as 1.1266. This Tuesday, several Fed's officials will offer speeches, being the most relevant the one from Chief Powell due to deliver a speech titled "Economic Development in High Poverty Rural Communities" at the Hope Enterprise Corporation Rural Policy Forum, in Mississippi. The pair trades a couple of pips above the mentioned daily low and at levels last seen mid-December, down for an eight consecutive trading day, which leaves it oversold short-term, although with no signs of downward exhaustion, which means the decline could continue during the upcoming sessions. 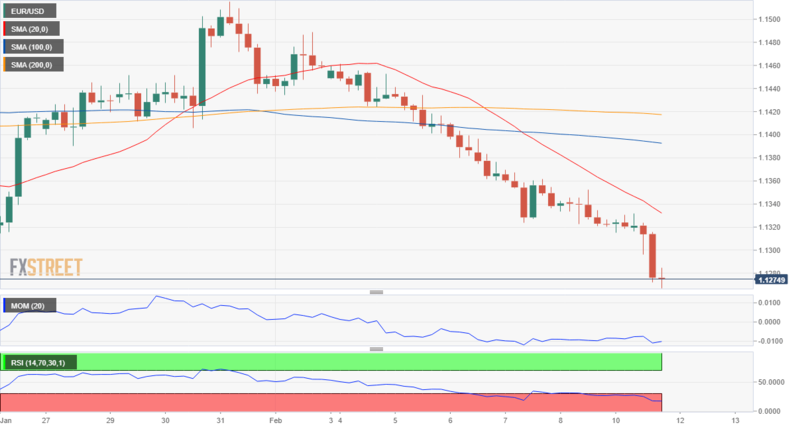 In the 4 hours chart, the 20 SMA accelerated its decline, now at around 1.1335, the Momentum indicator resumed its decline within negative levels, while the RSI hovers around 25, all of which exposes the pair to a test of 1.1215, 2018 low.